Our Minnie Moms are back from summer vacation and it's time to discuss 'Must-Do' attractions as we gear up for fall visits to Walt Disney World. Janine: My 'Must Do' attraction is a selfish one, because it is MY favourite ride. 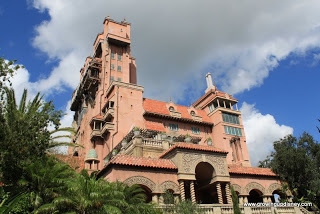 I absolutely love The Tower of Terror and have been lucky enough to ride it at least once on every visit I've made to WDW bar one (when I was pregnant) and even at Disneyland Paris. Last year I even rode it alone as Tink was too small to ride so daddy waited outside with her while mama got to enjoy herself. I know that not everyone is into thrill rides, and although this isn't a super-fast roller coaster, the fact is is up very high and has several drops and parts are in the dark, means that it is not everyone's cup of tea, but for me, those are the things I most like about it. I also relish in the fact that there is now the random drop sequence so every time you ride really is not the same. Another point which makes this, for me, my 'Must Do' is that the ride also changes dependent on where you sit and what time of day it is. Riding on the front row in the day and the back row at night are 2 completely different experiences, and I just LOVE riding at night and being able to see the lights from the park below. If you haven't been brave enough to try it up until now - go on, I dare you!!! And I might just see you there! Corby: Obviously, I have lots of favorite attractions in each of the four Disney parks. Sometimes I'll have to miss some attractions due to the kids or time constraints, however. There are a few attractions though that I just cannot think about going to the park and not riding. It just wouldn't be the same. At Magic Kingdom it's, and I know this sounds crazy but...It's a Small World. I have to ride that attraction every single visit. It is a Walt Disney classic! There's just something about getting in the boat, waving to the controller and hearing the song over and over and over again. Makes me warm and fuzzy. Ironically, it's the one attraction my husband skips every single visit but I love it! At Epcot, I can't imagine visiting and not riding Spaceship Earth or Living with the Land. That would be a crime. My whole family enjoys the two attractions and we typically ride them over and over again when time allows. Does anyone else love the waterfall scene smell as much as I do? If I could bottle it up I would! At Hollywood Studios, it's Toy Story Mania hands down and at Animal Kingdom it's definitely Kilamanjaro Safaris. If I had to pick one out of all of them, I'm going with “The Happiest Cruise that Ever Sailed,” It's a Small World. Natalie: Vacations to Disney are hectic. My family loves to go all different times of the year. In fact, this year, we have gone for New Year’s, Spring Break, the Fourth of July and Labor Day. As you might imagine, many of these times to visit Disney were extremely crowded. The visit on New Year’s was, at times, so crowded I wondered if we could even walk across Main Street must less get to an attraction! My favorite attraction in the Magic Kingdom has long been a variety. I know. I am supposed to write about my absolute favorite but who can really say! See if you agree with my line of thought. During certain times of the year, such as Halloween, I most love riding the Haunted Mansion. I love attempting to figure out all of the special effects and details of the storyline found within the attraction. I also love feeling a bit scared by the eerie attraction! Other times of the year, I most love Pirates of the Caribbean. Who doesn’t appreciate the fun boat ride as it moves through the intriguing story line which includes animatronics of Johnny Depp! However, my longstanding favorite is the Peter Pan attraction in Fantasyland. I cannot say why I love this attraction so. I believe it is the thought that you can fly and stay a child forever. Or it may instead be the use of beautiful pastels throughout the ride and the hide and seek with other famous Disney characters (such as Pocahontas). This is one of the few attractions I remember riding as a child. I remember loving the use of the speed ramps and how the Cast Members could use “pixie dust” to close the safety bar on the ride vehicle! However, the long standing problem with this attraction is that the lines are often times extreme. To get on, you really need a fast pass or to head to the attraction as soon as the park opens or right before it closes. If you are not able to do any of these, you will find that you are standing in line for over 45 minutes to catch your flight. In the end, I believe I would narrow down my favorite “Must-Do” attraction to all those attractions found within the Magic Kingdom! Each is special to me and my family in some way. Yep, all of the Magic Kingdom. Beth: Our family's must do attraction each trip is the Mad Tea Party. My kids absolutely love this attraction, and it always tops their own personal "touring plans." This has a very personal meaning to me far beyond the big smiles of my children as they try to spin my husband and I as fast as they can. This attraction was my very first Disney ride back in 1986. Though that was almost 30 years ago, I remember it like it was yesterday. Being able to now share that same feeling with my children, makes it quite magical to say the least. If I were to ask each of my children individually what tops their must do list, Emily (5 years old) would say Prince Charming's Regal Carousel, though she used to call the "horse go round." Hayley (7 years old) would choose It's a Small World. She has loved this ride since her first trip and dances the entire boat ride. Joey would say the Tomorrowland Speedway, which is now tall enough (well almost) to drive himself - quite a change from his first experience at the age of 3.5 years old! Each of these three attractions are experienced at least two to three times each trip. Clearly, I have raised three children who love Disney as much as I do. Our must do list is actually quite long for our trips, and I can imagine as they get older, it will continue to grow! Amy: My must-do attractions have evolved over the years. As a teen, I wouldn't have missed Space Mountain for anything, my history major self loves American Adventure, and as a mom, we always ride Small World and Living with the Land. But the one attraction that has always been a favorite and I never miss is Pirates of the Caribbean. 1. It's a great break from Florida heat. 2. Love that song. 3. Audio-animatronics, especially ones with hairy legs, make my inner Disney nerd happy. Many thanks to Janine, Natalie, Corby and Beth for sharing their must-do attractions! Please check out our Minnie Moms page for past articles and more information about this terrific team.